Umpires: If you are interested in umpiring any of our games please contact Ted Kelly at . All of our umpires volunteer their time to the league and are in no way compensated for their time (however a hotdog and coke are always offered after your time on the field!). We are looking for umpires for our A, AA and AAA League teams so if you have a day, week or can give your time to the league for the season we would appreciate your contribution. Field Maintenance: We will be looking for many volunteers as our Opening Day arrives to help clean up the dugouts, sweep, rake the inner and out fields as well as general pick up of the grounds. Please check back for an update as to how you can contribute your time to our fields. Electricians: We will be installing a new snack shack soon and we will need to have a certified electrician help up hook up all the wiring from the main Rye Recreation building as well as full interior wiring for the new snack shack that will include but not limited to outlets, circuit breaker box, GFI's etc. If you are interested in donating your time and/or materials for this project please contact Rich Coombs at or any of the Board members for details. Carpenters: We will be installing a new snack shack and we will need to have new cabinets and counter-tops installed in the building. We may also need to have a step build for the children to have access to the counter at the new snack shack. If you are interested in donating your time and/or materials for this project please contact Paul Predaris at .com or any of the Board members for details. Plumbers: We will be installing a new snack shack and we will need to have certified plumbers to install a new sink and water heater. We may also need to have someone help with accessing the water at the Rye Recreational building. If you are interested in donating yourtime and/or materials for this projet please contact Rich Coombs at or any of the Board members for details. Rye Little League cannot exist without donations from our community. If you are interested in donating to Rye Little League we would appreciate any monetary donation. While we will attempt to honor your request we cannot guarantee that your donation will be used as requested. We can guarantee that as a 501c3 organization 100% of your donation is used to better the league. Improvements included new bases at the Flash Jenness Memorial Field, new conditioners and new top soil on the field. We have also re-seeded the outfield in preparation for the 2013 hosting of the District II tournament. Many man hours and preparation were needed and many of those hours donated by Jeff Carroll Landscaping and Profile Lawns both of Rye. Monetary donations from over 50 families in our community as well as corporate support to make our dream of a new batting cage come through at the Flash Jenness Memorial Field. This included removal of the old batting cage, prep work for the new cage with all prep materials donated by Pike Industries of Portsmouth, NH and the entire site was funded outside of funds raised for the league in a special donation campaign just for this project! If you woud like to donate to Rye Little League please contact our Treasurer, Dan Beaton at or 603.379.2478 or any one of the officers on our Board to learn more about how your donation can make a difference. If you are looking for more specific information on donating to our league this year or making a donation to one of our longer term projects please see below for details. Two sets of bleachers - one for the home side, one for the visitors at the lower field at the Rye Recreation field. This bleacher is 3 rows 15' in length and seat 30 people each. If you would like to partner with Rye Little League on a long term basis consider a 5 year Hall of Fame partnership. 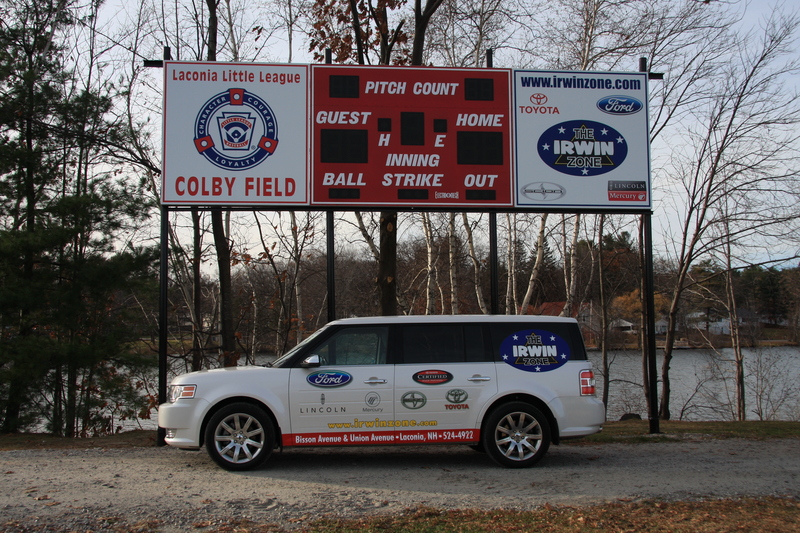 With your donation we would install a new outfield scoreboard and provide advertising space in the most prominent location for you and your organization. Outfield scoreboard prominent advertiser to the right of the scoreboard as shown above. Your company or name will be displayed for 5 years at Flash Jenness Memorial Field. You will also enjoy logo/company placement on our website. Final scoreboard model to be approved by Rye Little League,the Town of Rye and the Rye Recreation Committee. Outfield scoreboard single advertiser will be placed below the scoreboard as seen in the example above. Your company name will be displayed for 5 years at the Flash Jenness Memorial Field. You will also enjoy logo/company placement on our website. Final scoreboard model to be approved by Rye Little League and the Town of Rye and the Rye Recreation Committee. Outfield scoreboard advertisers will be placed below scoreboard (as shown above) and to the side of the scoreboard in similar dimensions as to the sign seen above. Your company name will be displayed for 2 years at the Flash Jenness Memorial Field. You will enjoy logo/company placement on our website. Final scoreboard model to be approved by Rye Little League, the Town of Rye and the Rye Recreation Committee. Your donation is appreciated and as you can see it will go to good use. Along with the above named projects and items donations offset the costs of our insurance, uniforms, safety equipment, safety clinics for our umpires and field maintenence (Flash Jenness field is solely taken care of by Rye Little League - all other fields are generously taken care of by the Rye Recreation Commission and SAU 50). To make a donation or if you have questions about donating to the league please contact our Treasurer Christin Keehbler at or 603.401.4795 or contact any Board Member. Rework the area behind the score's booth and around both sides of the bleachers to make the area safer as children run and play (eliminate the steep incline with additional materials brought in perhaps some material removed based on landscapers recommendations and Rye Recreation Department approvals). *100% of your donation would be dedicated to improvements suggested to the Rye Recreation Department. All improvements must be made by the Rye Recreation Department thus our donation would be for the specific project/projects approved. We would be happy to consider any and all suggestions and work with any organization who is willing to donate money, time and manpower to this endeavor.